Today is mrslovey’s birthday. Due to the timing, amidst the holidays, she has often felt that the day gets overlooked, sometimes shrugged off as people are making their plans for a fun night on the town. We learned long ago that trying to go out to a nice dinner on the actual day was an exercise in frustration – restaurants are overcrowded, with very limited menus. Now our tradition is to do birthday dinner out a little later (last year we didn’t go out until March, but damned if it wasn’t one of the best dining experiences we had all year!). Anyway. To keep the day itself feeling special, I offer mrslovey the cake/baked good of her choice. Whether it’s an old standby or something new that she’s curious about, I’ll do my darndest to provide. 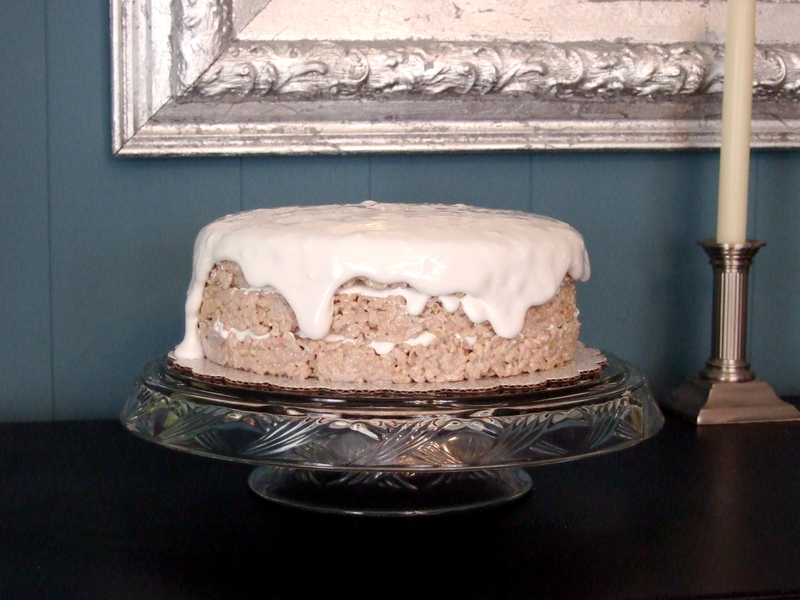 This year’s selection is actually a repeat from a couple years ago – Krispie Treat Layer Cake. Apparently it made quite the impression the first time around, so we’re gonna do it again! 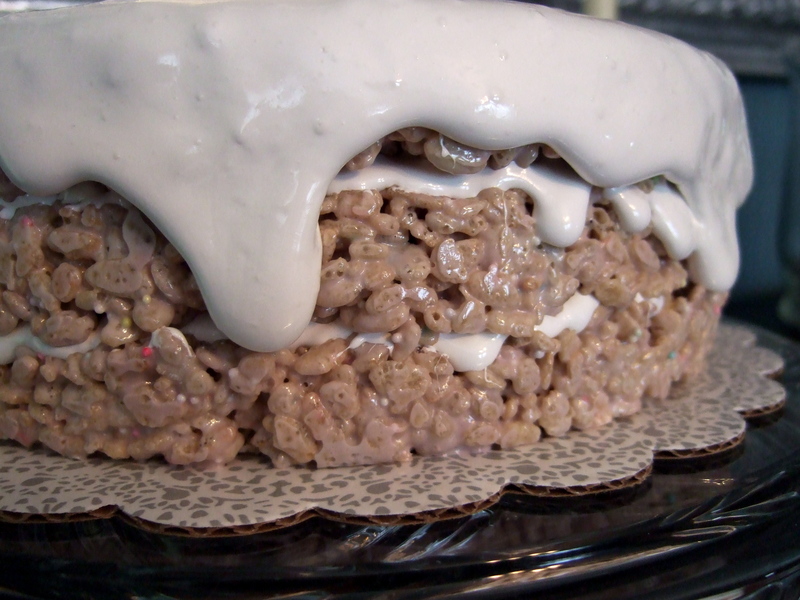 It’s mostly a standard Krispie Treat in a different shape, with a slight revision or two. Many moons ago, when we lived in the Midwest, there was a local coffee shop next to the store I worked at (this is relevant, promise, just bear with me). Now I’ve never been much of a coffee drinker, but the staff were nice, and they had a small selection of baked goods available. The most glorious of all their offerings were Krispie Treat Muffins. Big, beautiful, amazing orbs of Krispie goodness. Frustrating, because no matter how many times I tried, theirs were always better. Finally, I resorted to begging. “Coffeebaking girl, puhleeeeeeease tell me what makes your Treats so special!!!! !” Her response? Vanilla. Yeah, that’s not at ALL in the original recipe. Several moons after *that*, when we were back in New England, and I was all proud of my vanillafied Treats, one of my coworkers got married (again, wait for it!). The wedding was beautiful, the reception was a shimmery fairy tale, but the most important part was that for their honeymoon, they went to Puerto Rico. AND BROUGHT ME BACK PUERTO RICAN VANILLA. Totally different flavor profile, let me tell you. Not quite coconut, but definitely tropical. Try as I may, that’s the only word I can come up with to describe it. This discovery has brought my Treats up to a new level of wonderful – now people beg ME “lovey, puhleeeease tell me what makes your Treats so awesome!! !” I tell them about vanilla, and if they’re really lucky, I’ll tell them about Puerto Rican vanilla. So mrslovey, on this, the occasion of your 38th birthday, I humbly present to you the most awesome Krispie Cake ever, the one with the Fluff frosting between the layers. Also, my love and devotion. I’m a hobbyist baker who gets rave reviews on my output – “you should do more with your baking! you have skills!” – so here I am, blogging as I experiment. We’ll see if more than 3 people read along. One reason for this project is to encourage me to bake more. Currently I’ll go through phases where I don’t bake for weeks on end, followed immediately by a weekend where I just MUST bake at least 700 things. I’m hoping this will even it out a bit. Due to a touch of (undiagnosed, unmedicated, but oh-so-there) ADD, I am sometimes paralyzed with all the different choices of what to make next. To that end, I’m going to attempt a different category each month, to help direct my efforts. Of course random things might still pop up, but I’ll try to keep to the month’s theme as much as possible. As time progresses I’ll be working on developing more of my own recipes, but to start it will mostly be one of the zillion recipes in my ‘to try’ file. Anything used that isn’t my own will be appropriately recognized. Anyway, thanks for popping in, hope you enjoy. If you see any glaring mistakes or stupidity, please feel free to (gently) let me know. You are currently browsing the loveysoven blog archives for December, 2009.